Der Sauerampfer gedeiht in diesem Jahr besonders prächtig. Seine Blüten sind zauberhaft und leuchten in der Abendsonne wie kleine Juwelen. Er ist jedoch nicht nur eine Augenweide, sondern auch in der Küche ein Genuss! Eine meiner liebsten Frühlingsvorspeisen sind Sorrel Egg Pots. Es geht ganz einfach (für 2 Personen): kleine Förmchen einfetten, Ofen auf 140°C vorheizen. Eine gute Handvoll klein geschnittenen Sauerampfer (ohne Stängel) kurz in 1EL Butter dünsten, in die Förmchen füllen, ein Ei und 2EL Crème fraîche (pro Förmchen), ein wenig Schnittlauch, Pfeffer und Salz dazugeben, und hopp in den Ofen. Nach ca. 12-13 Min. ist es fertig, das Ei sollte noch weich sein. Dazu frisches Brot, hmmm, fein 🙂 In der Vase halten sich die Blüten lange – hier habe ich sie mit Butterblumen kombiniert. Dabei fiel mir ein, dass ich früher meiner Mutter oft Butterblumensträusse pflückte. Ihr auch? Happy Monday und danke, liebe Cathy, für die inspirierende Montagsvase. Besucht sie hier, dann seht ihr die Sträusse, die diese Woche die Tische der Blogger auf der ganzen Welt zieren. Sorrel has been doing very well this year. The flowers are so pretty and shine in the evening light like precious little jewels. It’s not only beautiful but also useful for cooking! One of my favourite spring starters are sorrel egg pots. It’s very simple (for 2 persons): butter two ramekins and preheat the oven to 140°C. Braise a handfull of chopped sorrel leaves (stems removed) in a tablespoon of butter for a few minutes, pour into the ramekins, add an egg and 2 tablespoons of crème fraîche (per ramekin), some chives, pepper and salt. Bake in the oven for about 12-13 minutes, the egg should still be soft. Serve with fresh bread, yummie 🙂 For my vase I’ve combined the sorrel flowers with buttercups, both last for quite a few days. Picking the flowers reminded me of how I used to bring my mum buttercups when I was a kid. What about you? Happy Monday and thanks to dear Cathy for the inspiring Vase on a Monday. Make sure you pop over to her to see which flowers grace vases all over the world this week. Beautiful photographs Annette. I don’t actually know the taste of sorrel but your recipe makes me want to try it. Have a great week. Wunderschoen! Sorrel is perfect in a baby-leaf type salad. Before we moved to the Outer Hebrides, we used to grown cultivated forms of it in our various gardens over the years, but here it grows prolifically in the wild, in various forms. The sheep love it, the hens love it, the geese devour it! Your vase gives a lovely golden glow, I don’t grow sorrel but perhaps I should. Christina, the sorrel grows wild in our meadow but I’ve also some red-veined in the potager, leaves are tougher though, I use it in salad. Does it not grow wild where you are? Lovely vase, full of light. I remember picking poppies and cornflowers for Mother’s Day in May. What a fabulous vase and I love how you captured the light! I must try and plant sorrel and make the recipe! Was für schöne Erinnerungsvase, Annette. Sauerampfer und Butterblumen erinnern mich auch an meine Kindheit. Früher wurde der Sauerampfer beim Spielen von der Wiese als Durstlöscher gekaut ;-). Köstlich, habe ich schon lange nicht mehr gemacht. Gepflückt habe ich ihn nicht unbedingt für die Vase, glaube ich, aber Butterblumen natürlich schon. Und Margeriten, die für mich bis heute den Hauch des Besonderen haben. Vielleicht, weil man sie mittlerweile nicht mehr auf vielen Wiesen sieht? Jedenfalls danke wie immer für den trip down memory lane. A little vase of sunshine for a Monday, lovingly photographed. Your recipe I have immediately copied and pasted to try soon. I don’t seem to get sorrel to germinate, will have to try to introduce as a plant. The red-veined one is a grand idea. I’ll search about for the native one, as you suggest. The golden glow in your photograph is lovely Annette. Is it wild sorrel you use, or a cultivated version? It’s the wild one which grows in our meadow but I’ve also the red-veined sorrel in the potager which I use in salads. 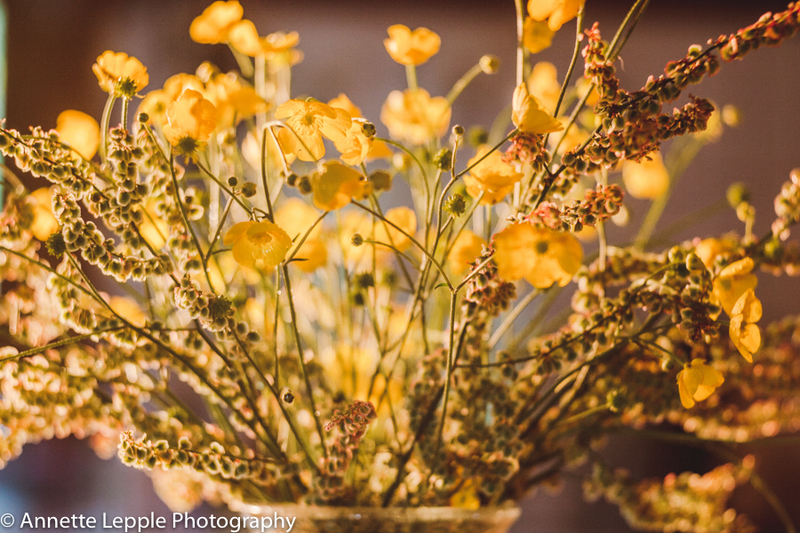 The sorrel and buttercups make a sunny composition in a vase, Annette, and your recipe sounds scrumptious! 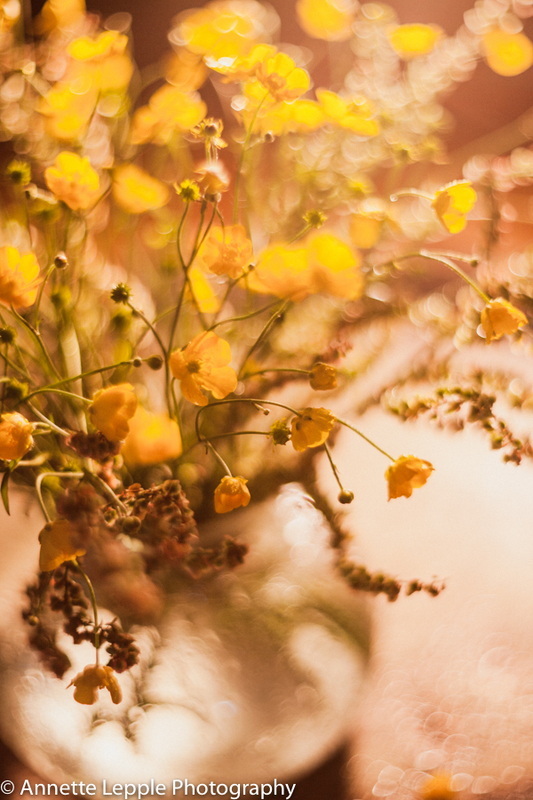 The sorrel looks like spun gold with the buttercups – so very pretty! Yes, I remember taking home a bunch of buttercups for my Mum when I was very young and she was not amused as she had been trying to eradicate them from our garden for several years after we had moved there and had forgotten how pretty they can be! I shall have to try the recipe you have kindly shared. Do you think the red veined sorrel will work? I’ve got that one too in the potager. Leaves are a little tougher than those of the wild one but it’ll work. Beautiful photograph Annette, we have wild sorrel growing in our meadows here, your description is so true – in the evening light they do glow like precious jewels. Thank you, Julie, we have it in the meadow too, got to make sure it doesn’t seed about too much. I like the bokeh, it’s so special. Liebe Grüße und eine schöne Woche!! Das Pfaffenhütchen wächst gut und trägt schon Früchte 😉 und die Ipomea lobate klettert langsam am Carport hinauf – ich mach gelegentlich mal ein Foto! Danke – das wünsche ich Euch auch!! I like this arrangement, very pastoral. I have no idea what sorrel tastes like and now I am curious.